With the 2015 WNBA season underway, I want to bring your attention to a matter that is rarely discussed, but is necessary for the growth of the women’s game. Every year, the NBA Draft is flooded with underclassmen who decide to leave college early to punch their tickets to fulfill a lifelong dream. However, this isn’t the case for female basketball players. With a few exceptions, they usually exhaust their eligibility to get their degrees whether they plan to play professionally or not, mainly because the WNBA salaries are like minimum wage compared to what NBA players make. In addition to the WNBA, players have to play overseas just to break six figures, while the average NBA player can earn six figures just for showing up. Although, the WNBA is barely tw0-decades old, has shorter seasons and fewer teams and sponsors, the financial disparity is wide. Now, the veterans and star players such as Candace Parker and Diana Taurasi have million dollar networths after endorsements, but the WNBA currently has a maximum salary of $107,000 annually. Some of the coaches make more than double the salary of star players. The landscapes of the NBA and WNBA are totally different. The WNBA has 12 teams compared to the NBA’s 30. The NBA Draft consists of two-rounds of 30 selections and the WNBA Draft consists of three-rounds of 12 selections. On the men’s side, the No.1 pick goes to a team where he is expected to start and have an immediate impact. However, the No.1 pick on the women’s side ends up going to a team with a terrible record, but it’s still loaded with talent because there aren’t enough teams to spread the wealth. Furthermore, first-round picks in the WNBA Draft are not guaranteed a contract, and technically still have to tryout for the team they are selected by. If there are 20 women trying out for a 12-player roster, either a current player or drafted player isn’t going to make the cut. For example, in the 2012 WNBA Draft, Louisiana State University’s Lasondra Barrett was the 1oth pick in the first-round by the Washington Mystics, but she wasn’t on the team roster for the season opener. On the other hand, it’s not that women college players aren’t gifted enough to make the jump to the pros sooner than graduation, because players like Brittney Griner, Maya Moore, Odyssey Sims and a few others could have easily declared early for the WNBA Draft and been top picks. 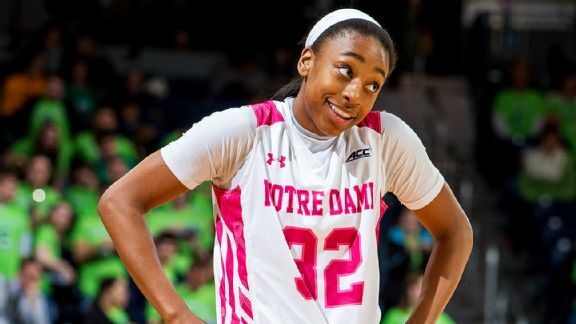 So, why is it that when Jewell Loyd – 2015 espnW National Player of the Year – decided to forego her senior season at Notre Dame, she received backlash from her coach, former teammates and fans? Loyd’s decision turned out to be a good one because she was the No.1 pick taken by the Seattle Storm. Why wasn’t Loyd’s early declaration breaking news on “SportsCenter?” Why wasn’t she praised for being a trailblazer for the women’s game and opening the door for future players to follow in her footsteps? EspnW Sports Columnist Kate Fagan gives us further insight on this issue. Thanks so much for your support! My goal is for my followers to leave with more insight than they had before visiting my site.